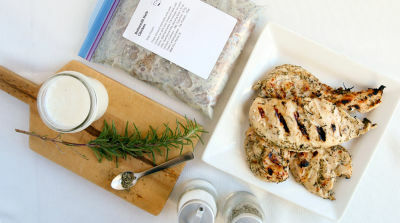 Marinated in creamy herb fortified buttermilk, this Instant Pot version of our Buttermilk Herb Chicken yields a main dish that is juicy, flavorful, and ready in no time. Add a simple side of buttered green beans or summery corn on the cob to round out your dinner plate. Once A Month Meals offers custom freezer meal plans to meet your family's needs. Sign up to add this recipe to your own custom meal plan. Let marinate in refrigerator for at least 1 hour. Place chicken breasts and marinade into inner pot of pressure cooker. Divide chicken and all other ingredients among indicated number of round containers. Label and freeze. Place frozen contents of container in inner pot.